Ultimately our wardrobe not only reflects but also enhances how we feel on any particular day. On the work floor we want to radiate authority and trustworthiness. For this we need outfits and color palettes that boost our lady boss confidence levels so we feel on top form all day every day! Having a go-to uniform also makes your morning routine a lot less frantic and colleagues will think you look amazing every day. Think of a formula that works for your body type and that you can fall back on without thinking too much. One that suits you, makes you feel sharp and composed and is comfortable enough for an 8 hour workday. We at Pure Brands love clean-cut print dresses and statement blouses combined with simple skirts. Other options are statement skirts and solid-colour fitted knit sweaters. Or dark pants or jeans with a cool top or jacket. Colours blue, white and black work in all seasons and across any industry. We'd also suggest considering adding some splashes of ivory, red and grey. If everything in your office wardrobe is in one of these colours, you'd be amazed at how many cool combinations you can come up with. The Dante6 Duncan leather pants in Raven are crafted from soft and supple Nappa leather. 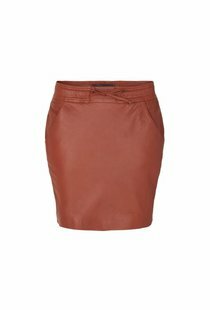 With a high waist with a ruffled effect and a matching leather waistband to accentuate the waist. Has two side pockets and small splits at the hem.